Anat Ben-David, Jessica Broas, Chicks on Speed, DAT Politics, Christopher Dobrowolski, Pil and Galia Kollectiv, Mister Ministeck, Noriko Okaku, Erkki Rautio, ROR (Revolutions on Request), Hiraki Sawa, Hideyuki Sawayanagi, Dallas Seitz. “There is time for peace and there is time for war. There is time for movies that take a cautious approach to sensitive and complex issues and there is time for movies in which Good Guys kick the living daylights out of Bad Guys without burdening themselves with any serious contemplation.” This essay discusses violence, heroic action, neo-pragmatism and political conservatvism in contemporary Hollywood action hero genres. 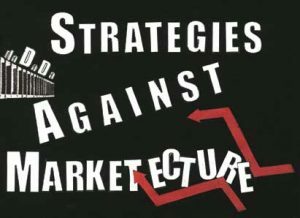 Presented as a paper at the Art Historians Conference, Dialogues Discourses Difference: Paper; 2005, Bristol, and published later in edited form in the catalogue Da Da Da, Strategies Against Marketecture.